This pleasant 25-year-old female was interested in changing the projection of her chin. She thought her chin was under projected and was interested in changing her facial profile. She had had previous orthodontics. Her teeth were perfectly aligned and she had nice projection of her cheekbones. We discussed different options to change the profile of her chin. We discussed using a chin implant to give her more projection of the chin. Another option to address this included orthognathic surgery, surgery in which the bones of the jaw are repositioned to give the desired result. After consulting with her dentist and fiancé, she decided to proceed with the chin implant. 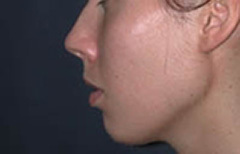 She underwent chin augmentation with an implant. This was performed under general anesthesia as an outpatient. 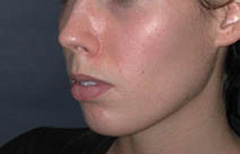 An incision underneath the chin was used to place a Medpor chin implant. At the time of surgery, the 7 mm implant was modified to fit her chin advancement needs. Six weeks after surgery, she had recovered nicely and was doing well. She was happy with the results. She was pleased with the facial profile. She had good sensation to the lower lip and the scar had started to fade. 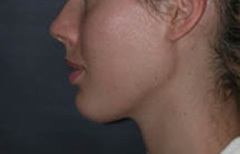 Her photographs at six weeks show the change in the facial profile compared to pre-op.